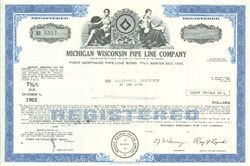 Pack of 100 Certificates - Michigan Wisconsin Pipe Line Company - Price includes shipping costs to U.S.
Home > Certificate Quantities for Educators / Business Promotions > Pack of 100 Certificates - Michigan Wisconsin Pipe Line Company - Price includes shipping costs to U.S. Beautifully engraved certificate from the Michigan Wisconsin Pipe Line Company This historic document was printed by the Security Columbian Banknote Company and has an ornate border around it with a vignette of allegorical figures flanking the company's logo. This item has the printed signatures of the Company’s President and Secretary. Michigan Wisconsin Pipeline Company is a superfund site located at Lease Road To Storage Gas Well 3, Weidman, MI 48893. The Environmental Protection Agency (EPA) identifies sites such as Michigan Wisconsin Pipeline Company because they pose or had once posed a potential risk to human health and/or the environment due to contamination by one or more hazardous wastes. Michigan Wisconsin Pipeline Company is currently registered as an Archived superfund site by the EPA and does not require any clean up action or further investigation at this time.